The Vision: A calming mixture of dry stream and waves of nature inviting grass. Creating better visual balance is key. When I envision a calm harmonizing place I think of the zen garden. The subdued palette, natural material and simple symbolism. I think of its interactive purpose in bringing you fully into the present moment. Traditional monastery dry gardens are walled. Perhaps to keep the eye from wandering beyond the lines raked into an ocean’s waves. Perhaps its metaphor for the ego boundaries create. In all of its qualities, calm resonates most these days. Being the near polar to calm, it may take a few tries. So imagine a dry pond of simple light gray rock. Sitting at the patio table you only get a glimpse of its flat sinuous line. In front of it lies a mound of evergreens and flowing grass. As you walk around the pea gravel path towards the apple tree a path appears to your left. Sunk between lines of grasses. I want to know what a garden of 60% natives looks like. In my reading its an exciting prospect, and a leap into the unknown in some ways. Search Piet Ouldolf and see what I mean. His art brings life. I can’t think of a grander gift to us all especially now. Its a reminder of the rare beauty of tall and short-grass prairies. While you can still travel to see Pawnee National Grasslands, not many suburban areas represent it well. 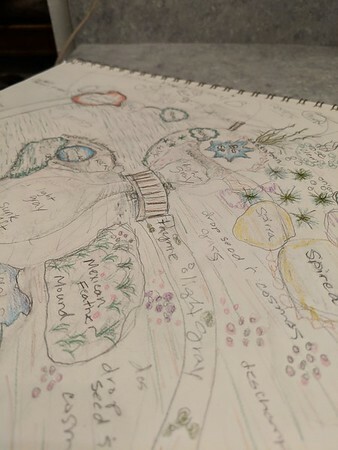 So what does a native JeffCo garden look like? Its quite grassy, with sparse bursts of flowers. A tree here and there. Tall bushes line furrows of creeks. My prairie grass need not be what you see in so much of our county open spaces. There they optimize for maintenance, as they must, and the toughest of grasses aren’t the showiest. But they are quite beautiful in fall. Its impressive how well Jeffco maintains our open space in their limited time for each area. But alas my grass will be a little fuzzier. Prairie Dropseed Grass and wildflowers replace the lumpy bluegrass and Dandelions. Alongside and around the foam of Grass a dry stream bed meanders, is a low bridge connecting to grass and grass lined paths. How will i frame this magic? Back bed moves forward at least a foot. And extends to the base of the ash. To the right a 6′ span of bright red dogwood stems and behind a shady spot along the back fence. Bright chartreuse leaves mix with honeysuckle. Blue hosta? to continue a line to the blue spruce and blue fence. If this year is as dry as I expect, it will be a good year to let the grass die under cardboard. Natives on all scales create space for displaced wildlife south of Chatfield Res. Back Yard, Envision, Garden Design go native, meadow, ornamental grass. permalink.